With the switch to Nike in 2020 its a good opportunity to reassess the direction I'd go for all 30 current MLB teams. So with any gilding the lily or further ado, here we go. 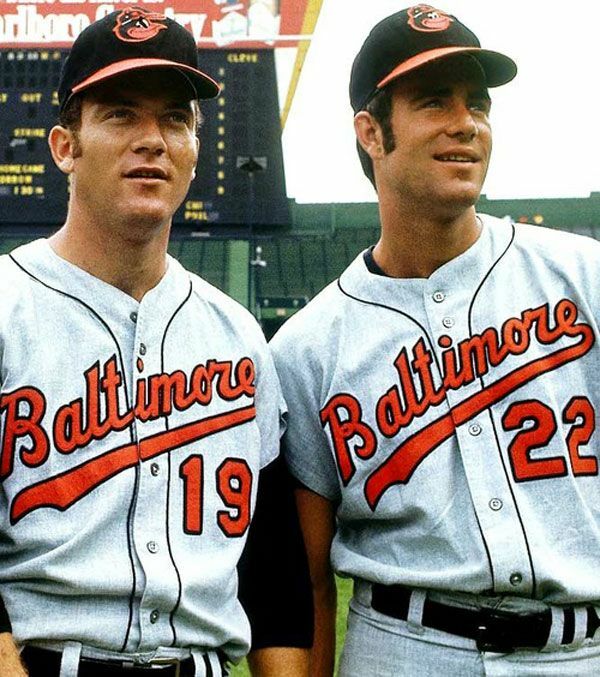 Although I love the current Orioles look, I've recently become interested in a lot of the uniforms from the early days of the Orioles that deployed solid black piping, especially on the road. The Orioles brought this back when they went retro in the 90's but I don't think they properly committed to that look. To that end, I've gone with double width black piping at home and away and a tail-less version of their modern script. The sleeve design is a take on the smiling bird that adorned the sleeve in the 60's and we have an all black alternate reminiscent of the original Baltimore Orioles who latter became the Yankees. Not sure why this hasn't gotten any responses yet. These designs are all fantastic. I never knew the Orioles needed placket piping before now! 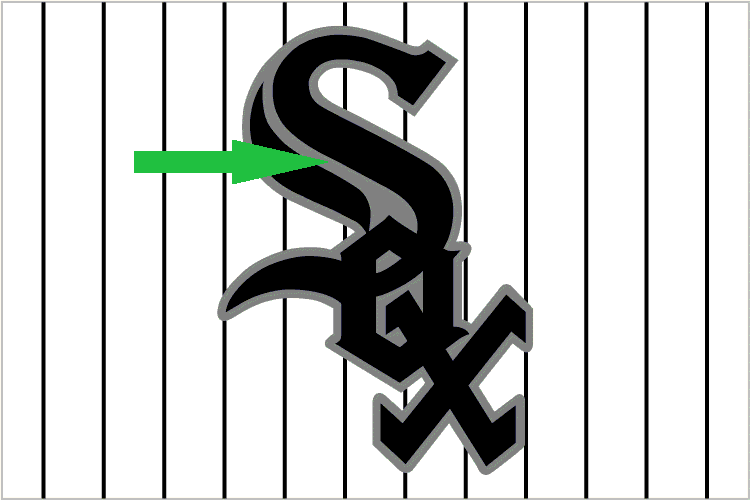 I also want to add that with that solid black alt, you've made me actually appreciate the "O's" logo. I never knew the Orioles needed placket piping before now! I wanted to evoke this early look for the Orioles. My favorite part of this look is the black alternate, that’s a great take on a fauxback. Well done! This one took a little more consideration. The uniform the Red Sox wore while Ted Williams was in his prime was one of the prettiest uniforms ever to see a Major League diamond. A key building block was the double headspoon the Red Sox wore with on their home uniform. The trouble is that today, the Carmines wear red baselayers which would render that kind of detail almost impossible to see. To get the double headspoon back, I've made the decision to revisit the navy undershirts worn by the team prior to 2003, at least at home. On the road the double headspoon isn't a well known a feature, so its less important and I think the grey uniform meshes well with the bright undershirt. 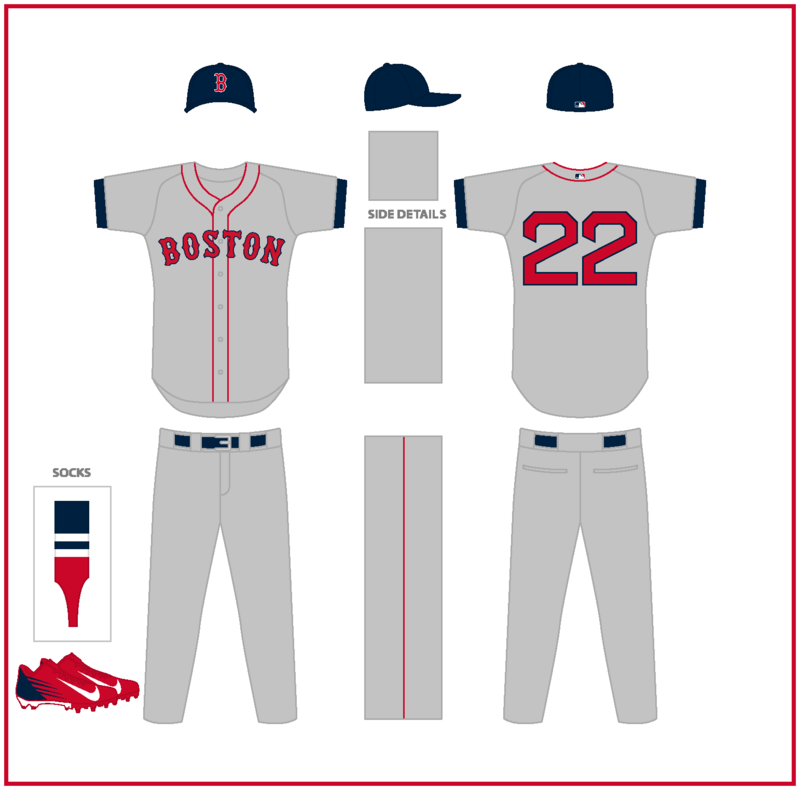 I've dropped all the alternates because a team with as classic a design as Boston shouldn't need them. Boston looks good. Solid reasoning behind all the design choices you made. I’m liking this series thus far! Baltimore - I like the placket striping and the decision to drop the tails on the scripts. The black alternate, while I don’t like the O’s insignia, is a fantastic addition to the set. It does make the taper on the home script fairly clear, which does create a bit of a problem when compared to the road design. It’d be interesting to de-taper it or use a mild taper on the “Baltimore” script, milder than the one used from 2009-2011. Boston - I like the return of the double headspoon and the socks. The only part I’m not sure about are the red undershirts on the road uniform. I would either flip the road lettering colors or use navy undershirts, for a better color balance. I’m excited to see where you go with the series! Excellent point. I'll get back in the lab and try to tweak the script. The only part I’m not sure about are the red undershirts on the road uniform. I would either flip the road lettering colors or use navy undershirts, for a better color balance. I see what you mean. Still not 100% sure but the navy undershirt does look good. I think this look in the early '00s suffered from bad quality baselayer materials, a chunkier "BOSTON" font, and a lack of headspoon. While I get back to tinkering with O's and Red Sox, I'll show the Rays. 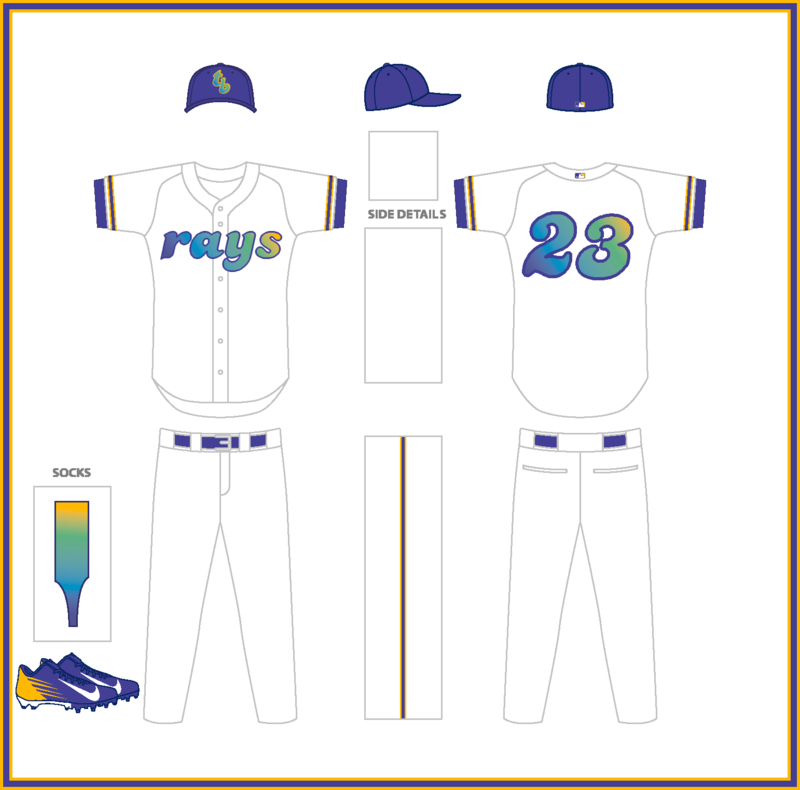 After much thought and deliberation, I've determined that making a uniform that actually looks good in 81 of the Rays 162 is probably impossible (at least for me). The lighting in Tropicana Field is too dim, the field turf looks bad, and there is no way I'm going to make fans who have stuck around that team suffer more by forcing them to play outdoors in 90 degree heat solely for aesthetic reasons. 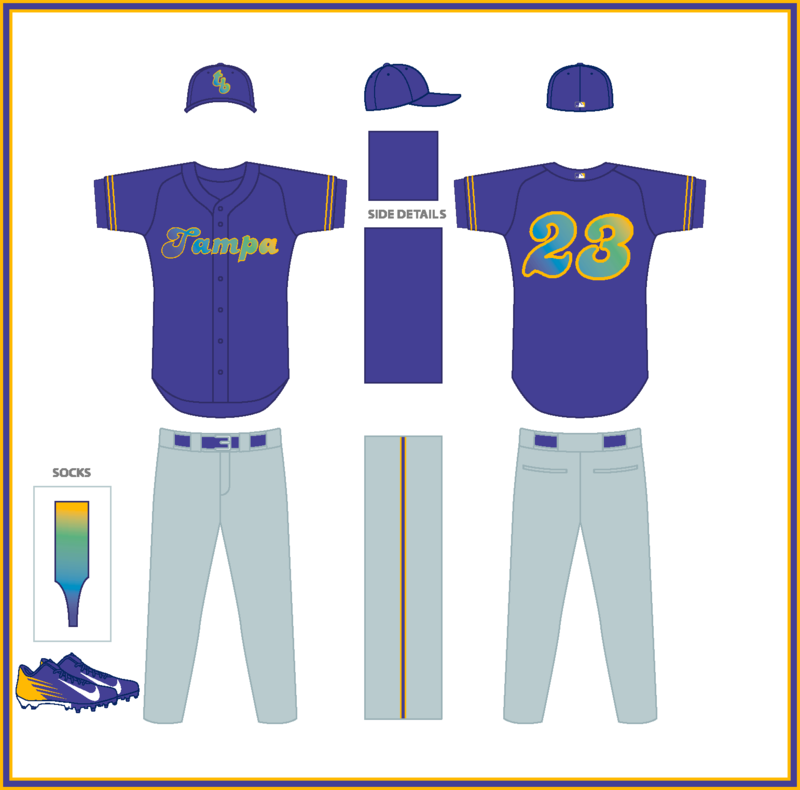 My two previous concepts have approached this by switching to green and powder blue while leaning heavily on the fauxback. I didn't want to go back to that same well so I figured the only way to make something look good would be to look at other teams who have played indoors and amp the color brightness to 11. 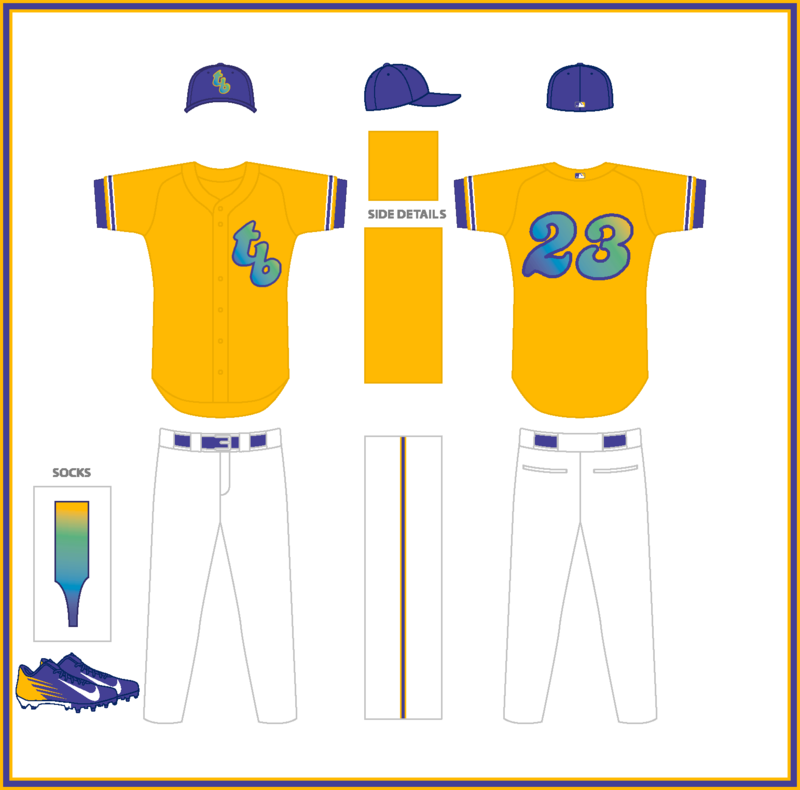 The solution was to lean on the original Devil Rays look with its color gradient and make the none-gradient colors purple and yellow like the Minnesota Vikings who really look good indoors. Only a truly funky script would match this hair-brained scheme so I figured out that the script the Rays use on their fauxback caps is called "Candice" and managed to make wordmarks out of that. (Thanks to @Victormrey for the help locating a more workable version of the font). I don't know if this will work but its worth a shot. Also I made the road uniform sea foam green because why not? Also reworking the Red Sox. I've tried out the 70's era cap and frankly I love it. I've always been a big fan of the Red Sox in red caps and the 70's uniforms generally. So while this probably will be seen as a downgrade by many, it's probably my personal favorite. Man, the Rays look awesome! Perfect combination of their original and ‘70s fauxback designs. The gold alternate is my favorite. Also, big fan of the Boston tweaks. I too have always liked the red capped look, and it’s a great way to set them apart from Cleveland. I love the Rays! The use of purple & yellow along with the gradient is an inspired choice. The Red Sox update is great as well, I’ve always been a fan of their red-capped identity, as well. Looking forward to more! Awesome work! That's for sure the most unique Rays "rebranding" I've ever seen! I can't wait to see more. Since the Yankees look is defined by simplicity, making significant changes is all about small details. Three small details are present in this set. 1. The crest on the home jersey now matches the cap. There's long been a discrepancy between the cap and jersey. I've tried hybrid logos in the past but this time I came to the conclusion that cap logo is far more graceful and iconic. It also better matches some of the earliest NY marks on the jersey. 2. The "New York" on the road jersey is taken from the 1918-26 uniforms but with an outline added to modernize it. That script is more airy and less heavy block than the font in use since the 70's. I also feel it makes for a smoother arch. 3. The numbers for both home and away are based off of the road script. (Note: They may similar to MLB standard block but share no lineage) I think the current athletic block is too clunky and I much prefer the style used on the DiMaggio/Mantle era uniforms which was lighter and less heavy. Solid tweaks all around. Hard to mess with (near) perfection. The Blue Jays have easily one of the best looks in all of baseball. Simple, clean, and perfectly in keeping with aesthetic sense of the city. Blue and white fit Toronto like no other city, with the Leafs, Argos, and Marlies playing along with the Toronto flag itself. All I've done here is expand slightly on what the Blue Jays have done. I've scrapped any navy trim, replacing it in the color scheme with light blue. The light blue now serves as the base for the road uniform just like the original Blue Jays design. I've also returned to the white panel cap with the home uniform, another simple fix as well as adding some stripes to the socks. The most radical change is the alternate uniform. In keeping with the sleek design scheme of the original Blue Jays, I opted for racing stripes down the sides of the jersey and over the shoulders. It's a look never sported by the Blue Jays but one which I feel is perfectly in keeping with their spirit. The racing stripes are a really cool touch on the blue alt. Nice idea! Looking forward to the next division! 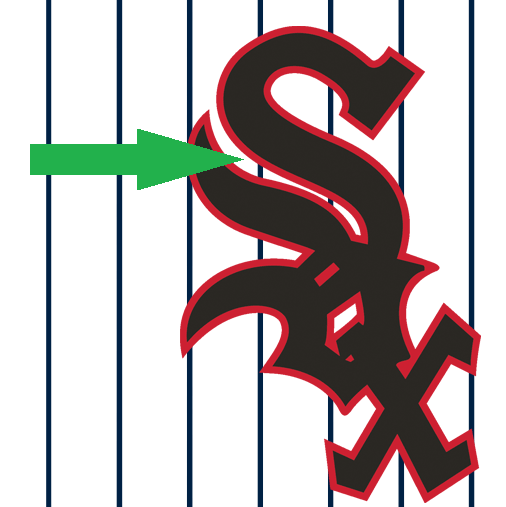 The last two White Sox concepts I've done have all been based off of the same black and white scheme with only minor tweaks over the past two years. You can look at my most recent version along with another idea here. Ultimately, for this series I decided to go in a different direction, namely changing the secondary color from silver to Kelly green. 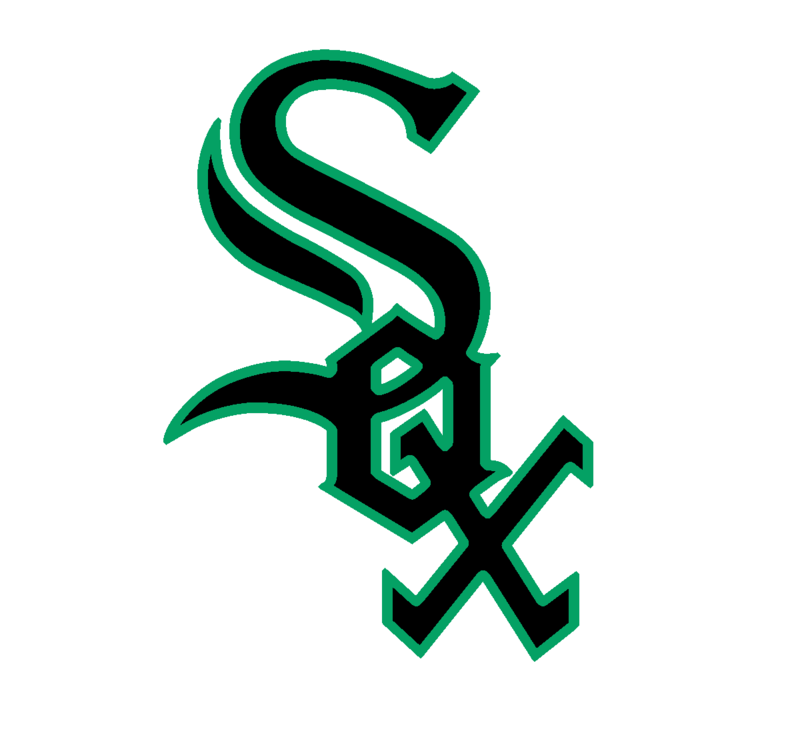 The Sox have looked good in green for their St. Patrick's Day promotions over the years which makes green an interesting direction and one the team has never fully explored. The green, however, is not the biggest change. You might think that the gothic S-o-x has remained unchanged since it debuted in the 1950's. However the original version in the 50's had negative space between the two verticals of the "S." The result is that the two verticals are distinct without being muddled. 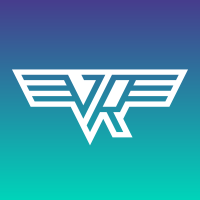 The current logo, has the "S" on a single background with no negative space. That works fine for a silver backdrop but try to switch it to another color and the logo becomes muddled especially when rendered in fabric. My solution was to go back to the original style and recreate the negative space by decreasing the thickness of the lettering. For the uniforms I applied a 1-2-1 piping formula. The white uniform uses a headspoon which the road and alternate uniforms apply collar piping. The sock have white bottoms and the belts have patterns designed to stand out and break the silhouette of the uniform. 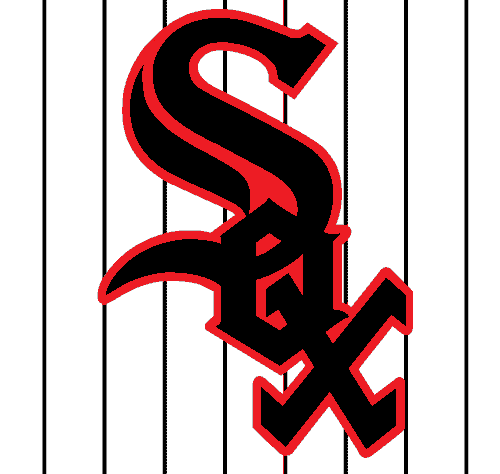 This is one of the most interesting White Sox concepts I've seen on this forum! Black and Kelly green work beautifully together, and I dig all the other changes, notably dropping the pinstripes on the home and going back to an arched block wordmark on the road. The all-black set is my favorite!